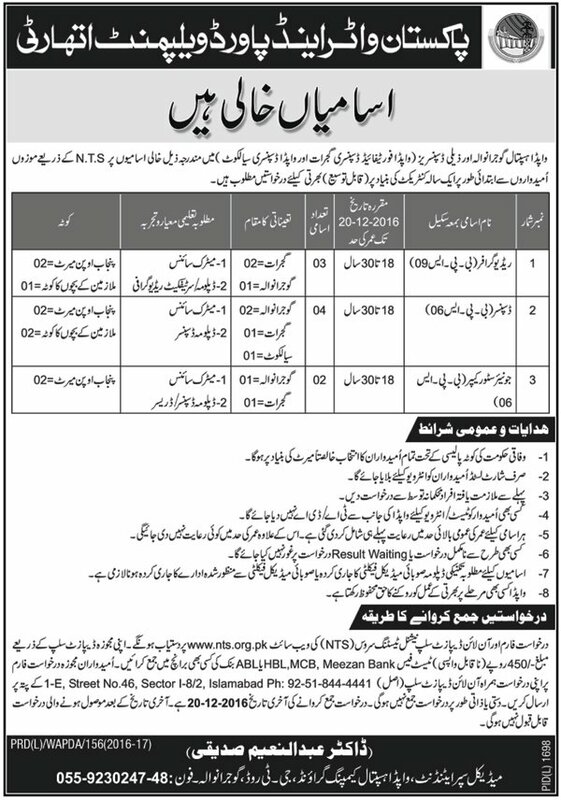 WAPDA Jobs: Pakistan Water & Power Development Authority (WAPDA) is inviting applications from eligible candidates for 9+ job vacancies of Radiographer, Dispenser and Storekeeper (BPS-6) under WAPDA Medical Services for WAPDA Hospital Gujranwala and WAPDA Dispensaries. See the notification below to see vacancies/positions available, eligibility criteria and other requirements. Eligible candidates can submit applications on or before 20th December 2016. Eligible candidates are required to download application from NTS Website at nts.org.pk – For complete instructions, please see the job notification given below.